... I see a pot boiling in the north, and it is about to tip over this way. A typical recession, as I have noted many times,* is precipitated by a bursting property bubble: property sales fall first, followed by property prices, then GDP. 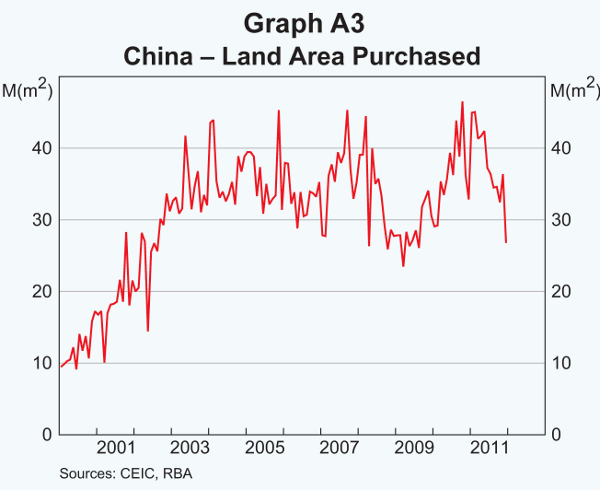 My attention was therefore arrested by two graphs that appeared in Box A (“China's Residential Property Market”) in the RBA's latest Statement on Monetary Policy. The first (in the order in which I reproduce them) shows that land sales peaked around Christmas 2010. The second (in the right-hand frame) shows that the peak in home prices came one or two quarters later than the peak in land sales. 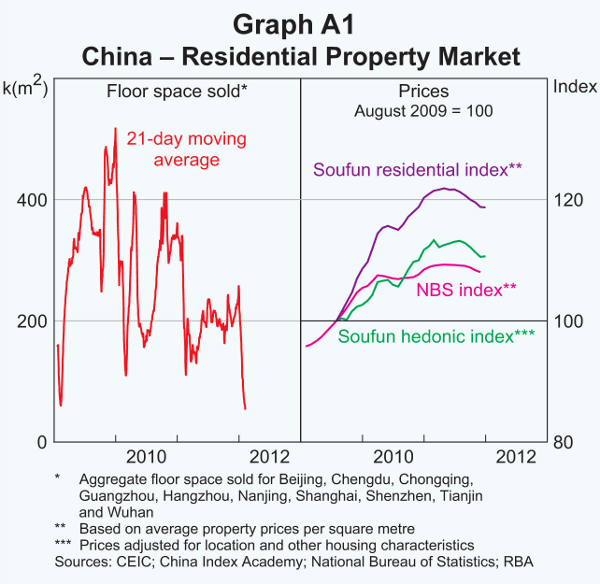 The story concerning sales of floor space (in the left-hand frame) is more complex, perhaps due to changes in government policy: stimulus from late 2008 to early 2010, followed by various anti-speculative measures. But the subsequent peak in sales in late 2010 still preceded the peak in prices in 2011. Rapid growth in prices through 2007 and 2008 caused rental yields to fall below 3%. Such low yields made price declines inevitable. Official loan/valuation ratios, which look conservative, must be regarded with suspicion on account of the “shadow banking” system. Price declines will hurt more than official figures suggest. So it is sufficiently clear that we are witnessing the second stage of a housing crash. How this affects the productive side of the economy depends on a great unknown: how does a command economy deal with bank failures? * See e.g. “From the subprime to the terrigenous: Recession begins at home” and “Bursting property bubbles: Sales crash first, then prices, then GDP”.